Pictures That Give is a fiscally sponsored project of The Children Are Our Future, a 501(c)3 located in Capitola, California. OUR MISSION: To use the art of photography to empower, advocate, and increase funding for individuals or groups through partnerships with non-profits or social service agencies. ABOUT US: Pictures That Give is a camera sharing program that uses photography to help those in need. I started Pictures That Give in conjunction with another small non-profit called the Wat Leu Village Children's Fund. With the help of a friend, I taught basic photography to a group of children in Cambodia, arranged an exhibit with their photographs to raise funds, then returned a year later with 50 pairs of shoes for all the children in that village. The program was so successful - and so rewarding - that I decided to bring it closer to home. CONTACT ME: If you know of a group or organization that might benefit from this type or program, I'd love to hear from you. Email me or use the contact form at the top of the page. I am excited to announce my new project with the Santa Cruz Museum of Art & History (MAH). I have been selected to be one of a group of artists collaborating with the Creative Community Committee (C3) group on an exhibition that will bring awareness to senior citizens and their struggle with loneliness and isolation. I will be doing a camera share with select seniors to help show what a day in their life looks like, and also be capturing portraits of them. I have already met some incredible people since I've started this project and I'm looking forward to helping the seniors in our community with my work. The exhibit will debut in April 2019 so come back often for updates. You can read more about C3 and the MAH by clicking this link. I am thrilled to once again be working with the Santa Cruz Downtown Streets team on a new project. DST has aligned their clean-up efforts with The Santa Cruz County Tobacco Education Coalition to focus on ridding our beaches of toxic cigarette butts. DST participants will be involved, with my help, in photo-documenting their efforts to bring awareness to the community. Our first clean-up effort was Sunday, August 26, at Cowell's beach and included a live community art installation made possible by Save Our Shores. Check out the gallery below for our pictures of the day. "...the Light In Shadows project was one of the best, most organized, and most successful Team Member engaged community activities that I personally have ever been a part of in the 7+ years that I’ve been working at DST. You really did an amazing job and the Team Members are still talking about it." 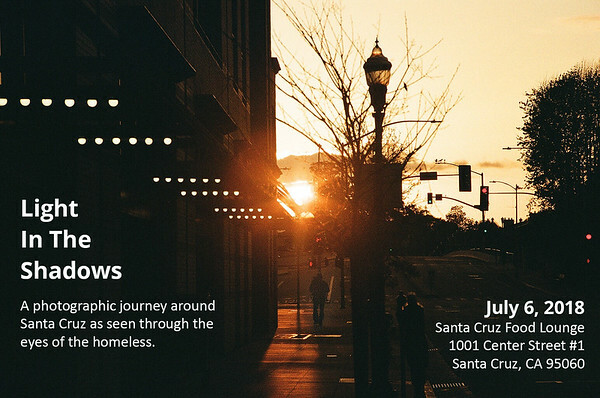 I recently completed a camera sharing program with members of the Downtown Streets Team in Santa Cruz, California, a group whose members who are all currently enduring varying degrees of homelessness. My goal with this project had many layers.Yes, we took pictures, we sold pictures, and raised money, BUT beyond the portraits are human beings trying to shed the stigma of being homeless. Mothers, fathers, grandparents, scholars, artists, even photographers. They are something besides homeless and I am pleased to have been able to bring the community together during this event to share what is so special about this group of people. Please see the "Light in the Shadows" collection to take a look at photos available from this spectacular event. Everything is available for sale and I will continue to share proceeds with the participating artists. Our fundraising exhibit featuring the photography of the Downtown Streets Team took place on First Friday, July 6, 2018 at the Santa Cruz Food Lounge on Center Street in Downtown Santa Cruz and was a huge success. With the funds raised from the sale of photos each participant received a $75 gift of their choosing. Photos are still for sale so please check the gallery for what's available. *Special thanks to Bay Photo Lab for their support in our printing needs for this event. DONATE: I am always looking for donations of used but working point-and-shoot digital cameras, along with batteries, chargers and SD cards. Small camera bags would also be welcomed. Monetary donations are also appreciated and can be made securely using the "Donate" button. BUY: Items purchased from their respective galleries will go towards helping the participants of that gallery. You can select a gallery to read more about the project and who it supports, as well as browse photographs taken by participants. The purchase of any photo helps all people of its respective group.